Last week I gave a brief presentation about communities of practice at the launch of Magic Whiteboards by INOV@R in Mangualde. Later, over wine, cheese, and conversation one of the teachers was enthusiastic about the active group of teachers he was part of, and with whom he felt he learned so much. He also observed that the success of this group - which he could now call a community of practice - could be attributed to the "magic fingers" of the school president. These fingers subtly worked to connect people and put opportunities for them to meet in the way. I thought that was a fantastic observation. And a great word. In my line of work we talk about facilitation. And now we have started talking about technology stewardship. How DRY!! Neither of those titles captures the magic and playful essence of community building. Neither do they say anything about the invisibleness of most of that work. And then there is the problem of translation. In Portuguese I really dislike the word animador for facilitator. It gives the idea of an entertainer, or someone who is jumping up and down rousing people to respond. But facilitador doesn't sound good in Portuguese either - making thing easy for someone is not something you associate with learning. And let's not even start talking about stewardship! How will I EVER translate that word, let alone the concept? From now on I'm sticking to metaphors for the idea of facilitation .. magic fingers - dedos mágicos. I'm invited to work with people on a project for starting a distributed community of practice using new technologies. The people in the team don't use RSS feeds or tags but understand the potential and want to introduce it for others. So in our team we communicate about the project via e-mail, telephone and face-to-face meetings. 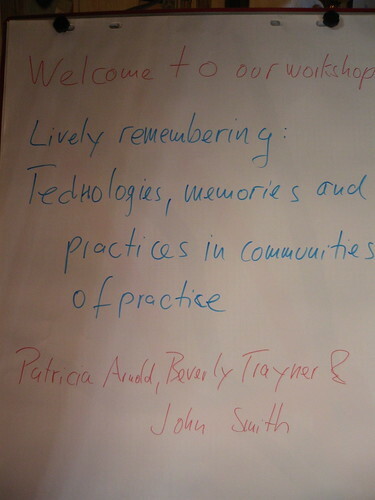 I'm doing a workshop about new technologies where the starting point may be a discussion group or forum. I introduce people to new technologies and start bringing their del.icio.us or flickr feeds into a shared space like a Wiki, or more recently, into Drupal. How do we trigger inventiveness with new tools? understanding Web2.0 is more than the sum of knowing how to use individual tools. How can you zoom in and out of individual tools and the bigger picture without making it feel overwhelming? The other day I was wondering if it wasn't worth my while spending some time at the beginning of a project to set up a Google homepage or a Netvibes page where the team I'm working with (in the first scenario) could get a feel for how RSS feeds (and maybe tags) could serve them. Even if I was the only one with a calendar, flickr and del.icio.us feed in their desktop homepage, they would also get a feel for what it was like if we to be some context as well as exchanging ideas, plans and information. Then I saw that Weblogg-ed is using Pageflakes as a student portal. Pageflakes is similar to Netvibes. A brilliant related idea! I'm going to set up a working group portal on Pageflakes or Netvibes for the project I'm working on. Team members will also be able to edit it. The rest of the team can have it as their homepage (or not) and sooner or later might start developing it and making it their own. I'm also going to set one up for the beginning of a workshop. Hey! I'm also thinking you could design a Pageflake page for the run up to an event or a conference... I think this has great potential for stimulating people imagination and it's a concrete way to help people get a picture of the overall benefit of the tools without them having to know how to use each individual one. I'm getting ready for the online preparation phase of a face-to-face meeting that will be taking place in Lisbon in October. People from different parts of the world will be spending an afternoon together because they are all partners in a programme in which each one plays a crucial part in their specific local context, but who haven't had a chance to see the wider context in which they are all working. The sponsoring organisation want to be sure that the afternoon when people are together face-to-face is productive - productive in terms of supporting potential relationships and of supporting partnerships between participants who could contribute to a changing and shared vision for the future. This isn't an uncommon scenario in international projects. And sponsoring organisations are coming to realise how much potential there is in having online preparation and post-event phases so that the precious face-to-face time can be used to its full potential. How can we make the most of the fact that people speak different first languages, rather than letting different languages be a barrier? How can we support those people who have easier access to e-mails than to the Internet. How to support both those people who are comfortable with technologies, those who don't have a clue about technologies, and all those in between? In the case of this particular meeting I have opted to use Drupal with the wonderful and patient help of David Wilcox whose blog is Designing for Civil Society and his son. In terms of technology and language Drupal has different language interfaces and we'll make use of Google language tools. There are thirty people participating in the meeting, so signing everyone up to Squeet (free email RSS reader) is a way of making sure that people get many of the messages from the Drupal site by email, even if they don't go there or subscribe to the feed. We will probably use Bryght "a hosting web-site service" based on Drupal. power relations change as people who are invested in one mode, language, or way of learning can feel quite vulnerable in another. Just changing one of these variables - technology, language or learning approach - is challenging enough. Changing all three can be very potent. I am interested to see how creatively we manage those tensions in relation to the mix of technology, language and potential learning.